To "roll" an option is to change a long or short contract's expiration date and/or strike price. This is done in one action but involves simultaneously closing a current position and opening a new one with the different strike or expiration. Example: Rolling a short put spread involves buying to close both existing positions and selling to open two identical ones further out in time or at a different strike prices. 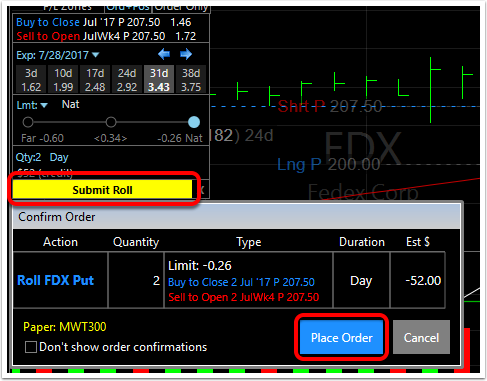 These are the steps to rolling a multi-legged option (the example will be rolling a short put spread. Important: To replicate the entire multi-legged position, repeat the steps above for rolling each leg of the position.